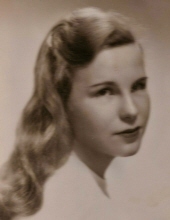 Deborah Woodworth Edgar, a resident of Concord MA since 1957, passed away peacefully on March 15, 2019 at CareOne in Concord in the loving presence of her daughter. She previously resided at Timothy Wheeler House, Concord. She was born in Boston MA, December 4, 1928 to Charles Parker Woodworth and Sarah Cheney (Fish) Woodworth, grew up in Weston MA, graduated from the Walnut Hill School in 1946 and attended Wheelock College. She married David LeRoy Edgar, September 11, 1948 at St. Andrew’s-by-the-Sea, Rye Beach, NH near her family’s summer cottage on Straw’s Point. Early in their married life, they spent summers at Hio Ridge Camp, Bridgton, ME, which he cofounded, where she worked in the infirmary, nurturing those who were struggling emotionally. They lived in Brookline before moving to Concord MA where he became the Headmaster of the Fenn School. The marriage ended in divorce. She worked as a kindergarten teacher, and as administrative assistant for Honeywell Corp., Pitney Bowes, Acton Medical, and retired from Wausau Insurance. For many years she was personal assistant to Mr. and Mrs. Charles Bovey Sr., with whom she had a long friendship. Lovingly devoted to family and friends, she is survived by her daughter Anne P. Edgar and grandson David C. DeCoste, of Concord, MA; many Woodworth nieces, nephews and cousins. Thanksgiving with Woodworth relatives was her favorite holiday. A lifelong Episcopalian, she was a longtime member of Trinity Episcopal Church, Concord MA. A lover of classical music, she was a member of the Concord Chorus and she attended the Friday afternoon Boston Symphony Orchestra concerts. A lifelong birder, she was a member of Mass Audubon. She also volunteered for the American Red Cross. Descended from Fish, Cheney, Woodworth, Goss, White and Parker founding families, she was a member of the National Society of the Colonial Dames of America and enjoyed attending meetings with her sister and cousins. A service of celebration of her life and faith will be held at Trinity Episcopal Church, 81 Elm Street, Concord, MA on Saturday, April 27, 2019 at 10 am. Interment of her ashes will be in Green Cemetery, Carlisle, MA. In lieu of flowers, please donate in her memory to the American Red Cross, PO Box 37839, Boone, IA 50037-0839 (wwww.redcross.org). "Email Address" would like to share the life celebration of Deborah Woodworth Edgar. Click on the "link" to go to share a favorite memory or leave a condolence message for the family.